Nationwide, nursing home abuse is a serious problem that must be addressed more by the public and in the media. 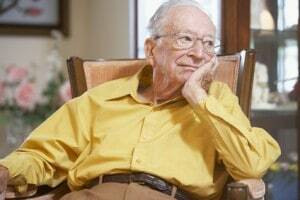 ABC News has reported that elderly citizens are abused in one in three nursing homes every year. The abuse that elderly citizens suffer can include untreated bedsores, malnutrition, inadequate sanitation, dehydration, preventable accidents and poor hygiene. It is important for family members to recognize when a loved one may be in an abusive situation in a nursing home facility. 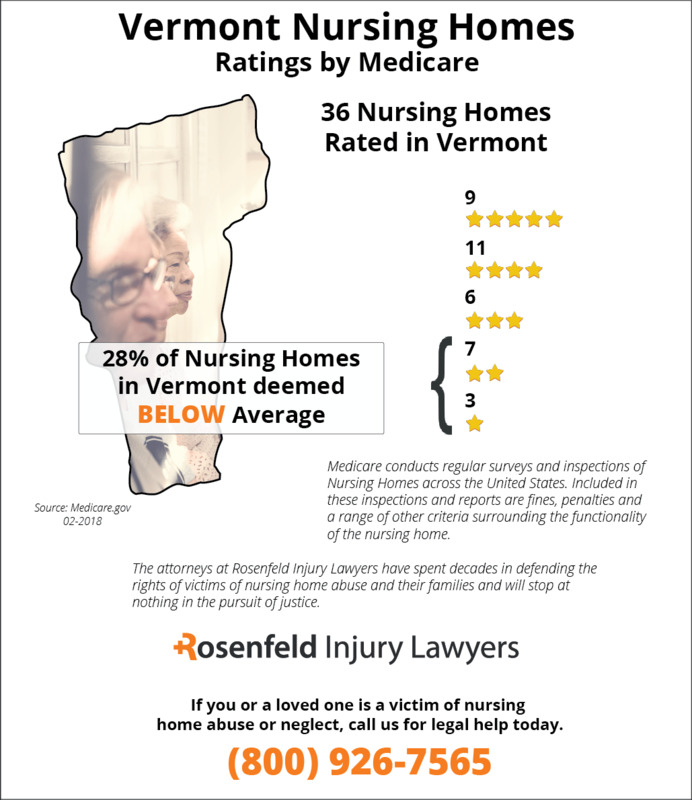 According to statistics maintained by Medicare, there are currently thirty-six nursing homes rated in Vermont based on national averages. This data involves inspections, surveys and investigations into formally filed complaints. The federal agency states that, currently, ten (28%) of these facilities are deemed to provide below average care based on identified violations and deficiencies. If your loved one was injured, mistreated, abused, or died unexpectedly through neglect while residing at of Vermont nursing home, we encourage you to contact the Vermont nursing home abuse & neglect attorneys at Nursing Home Law Center. Let our lawyers evaluate your claim for compensation through a free case review. It is unlikely that nursing home workers will actually make formal reports of abuse when they see it or suspect that it is impacting a loved one. It is up to family members to file a report of abuse and get in touch with nursing home lawyers who can help. With over 45 percent of Vermont nursing homes dispensing unnecessary drugs every year, there is a good chance that your loved one may have been a victim of abuse. Over 19 percent of Vermont nursing homes also have issues with infection control, which indicates that your loved one may have a great risk of developing an infection from unsanitary conditions. The statistics make it clear that nursing homes are not going to change their ways any time soon. It is up to you to speak with nursing home lawyers who can have an impact on your case and create positive change in the nursing home industry. In Vermont, there are strict nursing home injury laws in place to provide protections for residents in nursing homes. The Reports of Abuse Act and the Reporting Suspected Abuse, Neglect and Exploitation of Vulnerable Adults Act ensure that there are procedures available for reporting abuse, investigating abuse and ultimately holding administrators accountable for this behavior. The Reporting Abuse Act requires that any individual who knows of or has information of abuse must file a report with law enforcement within 48 hours of becoming aware of such information. The statute also goes to great pains to discuss at length the individuals who have a legal duty to file reports of abuse. The list of individuals includes employees in caregiving, teachers, case workers, mental health professionals, dentists, psychologists, nursing assistants, medical examiners and other professionals. If you want to learn more about the rights of nursing home residents, then you should get in touch with nursing home lawyers as soon as possible. Nursing home lawyers know also about the types of conduct that are considered to be Vermont nursing home abuse incidents, and they can also inform you with this knowledge. 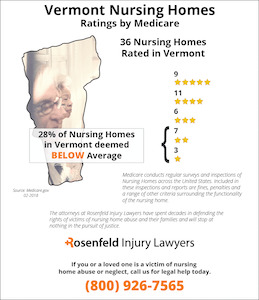 No resident should be the victim of Vermont nursing home abuse, and it is important for a resident to receive compensation if he or she is a victim. 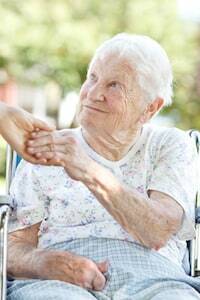 Nursing home residents have a right to receive adequate care under the law. Call a lawyer to learn more about the process of filing a lawsuit or settling a claim outside of court. Nursing home lawyers will help to protect your loved one at all stages of the investigation process and at trial. Vermont nursing facility patients bedridden or confined to a wheelchair are at an increased risk of developing bedsores (pressure sores; pressure ulcers; decubitus ulcers). Without proper treatment including wound dressings, debridement, and antibiotics, the wound can leave permanent damage or cause a fatal infection. Bedsores are most prevalent in any nursing facility patient who remains idle for an extended period. The wound usually appears when body pressure against an object restricts blood flow circulation to skin and underlying tissue. When the area is deprived of oxygen, reddening, inflammation and skin damage can occur within a couple of hours. This plan of action is especially important for individuals who are bedridden, bound to a wheelchair or incapacitated because of sedation or a coma. Bedsores can be prevented when there is adequate staff to provide proper monitoring, and the medical team has sufficient training in how to avoid the condition. Any developing or existing bedsore needs to be treated immediately with proven protocols and procedures including eliminating the pressure until the wound is allowed to heal completely. Unfortunately, many nursing homes are understaffed due to limited budgets or the lack of sufficient personnel for hire in the community. As a result, administrators are often left with hiring unskilled caregivers who have not received proper training on skin monitoring and “turning” protocols to ensure the patient’s health is fully managed. The patient can suffer immense pain when they do not have the capacity to readjust their own body weight without help. What You Can Do Following a Vermont Bed Sore? A Vermont nursing home attorney can file a claim or lawsuit on behalf of your loved one and your family to demand the financial recompense you deserve for your family’s loss, pain and suffering. The money received can offset the expense of medical care needed to help your loved one heal from the injuries caused by the negligence of others at the nursing home. Fill out the form here to contact an experienced Vermont decubitus ulcer lawyer from the list below. To avoid the need of any upfront fees, your attorney can accept your case on contingency where their legal services are paid from an out-of-court settlement or jury award.